It is said that the best gift you can give anyone, is your unconditional love and acceptance. This is especially true for healthy relationships- unconditional acceptance of your partner’s belief’s, attitudes and behaviors is important. Having said that, it is also true that unconditional acceptance is something that we all want, but we rarely give out. It is easier said than done. But, it can be learnt, and it is something that the people in our lives totally deserve. I am not a relationship expert, by any means. These are just the things that I have learnt in the past few years from experience, hindsight and SEVERAL mistakes. 1. Get rid of Unrealistic Expectations: It is okay to expect. You will need to attain a certain level of Nirvana, to be free of expectations. The problem is with the unrealistic variety. The kind that romantic novels and movies fill in your brain. For e.g. He may not always know the right thing to say, coz lets face it, he is not Ryan Reynolds, who is reading a script full of sweet, romantic quotes. He may not surprise you with flowers or chocolates, but he might choose to do the dishes without you having to ask, or he might even let you finish his tandoori chicken. 😛 The point isn’t WHAT he’s doing, it’s the thought behind it. 2. Love More, Judge Less: Like they say, counting other people’s sins, does not make you a saint. When we judge, we form a rigid opinion about someone, which makes it difficult to accept them for who they are. 3. Agree to Disagree: This will make it easier for you to accept your partner’s views, even when you might not agree with them. It is imperative to understand that everyone has a unique emotional outlook, and that many a times, there is no absolute right or wrong. It is just a matter of perception and perspective. True love exists. Perfect Relationships do not. Which means, while true unconditional love is possible, perfection is not. So, let’s strive for what is possible – which is loving and accepting the people in our lives, unconditionally. Interesting post. Its the expectations which create the barrier to unconditional acceptance. Ah! Enlightened! It felt nice reading, and realising, that there are certain areas I need to work upon. Thank you, Shantala, for this wonderful post. Wish you the best for the Challenge! Shilpa Gupte recently posted…New age shopping. Loved your post and your words are so true. There is nothing like a perfect relationship but there is true love. There is, indeed. Thank you for stopping by, Amrit. Glad to have connected with you. Thank you so much for stopping by, Sharu. Glad to have connected with you. What a beautiful post, Shanaya! That quote is just wonderful! Happy A to Z-ing! Thank you so much for stopping by, Vidya. Happy A to Z-ing to you too. Simply said and well said. Looking forward to more. Thank you, Pooja. Glad to have you here. Your write up was by far one of the best things I read for A. An interesting write up. I agree that unconditionable love exists but we must not takr it for granted. Unconditional acceptance does wonders to any relationship. But like you mentioned, it is often so hard to give. Loved your pointers. Rachna recently posted…Exams, results and vacations! Agree to disagree — so very true. Mr Imperfect and I have very diverse views on certain subjects and can both be stubborn. We need to agree to disagree. And I do agree that there is no such thing as a perfect relationship and every relationship takes work. Nice start to the challenge! [email protected] recently posted…Aspirations of A Mother! Great advice! What a great subject for A-Z. I was a silly romantic when I first met my husband. Looking for perfection in imperfection 🙂 Very nice. and quite true. Especially agree with the unrealistic expectations part. Thank you for this enlightening article! Your word ring very true and are inspiring. Thank you for starting my day off with such sage advice. Thank you for stopping by, Mee. Loved the A-List. Hope to check them out soon. I loved this article because it was so realistic and achievable. Unconditional love is all one needs. Thank you so much, Soumya. Glad to have you here. I loved your take on Awakening. Staying tuned for more. Nice start for the challenge Shantala.. Loved your quotes – “True love exists. Perfect Relationships do not” & ” you don’t need someone to complete you. 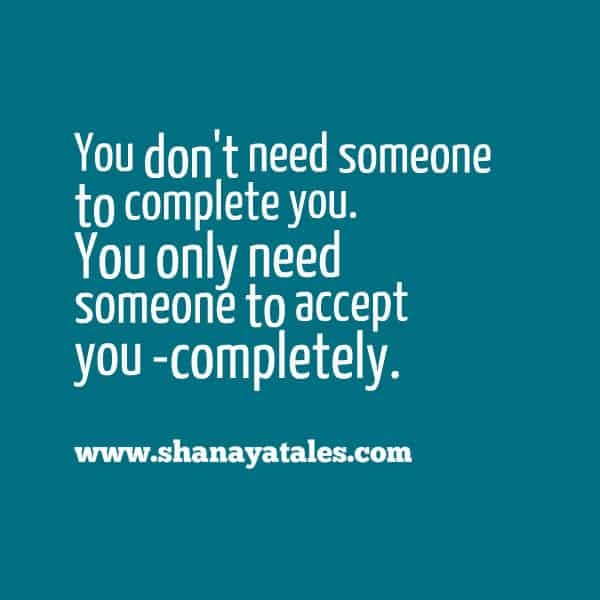 You only need someone to accept you completely”. Oh, yes! I’m glad that I have that someone in my life and I hope am the same for him. I believe that as we accept ourselves more, we can love the other better! We are truly blessed, aren’t we? 🙂 Thank you so much for stopping by, Corinne. I’ve been married almost 33 years and relationships are work. I always remind myself how imperfect I am so I shouldn’t expect of my husband. True love does exist. Wonderful, thoughtful post. True love exists but perfect relationships don’t…so true. Really loved the topic you chose for this letter. Unconditional acceptance indeed is a difficult virtue to imbibe and practice. All the best for the challenge! I nodded so much at this post, it is exactly what I have been going through lately, learning to accept both myself and my partner for who he is, exactly as he is now. Embracing his flaws and my own so I can see the bigger picture and discover the deeper sense of love beyond all of this. I look forward to keeping up with your challenge, it really resonates with me. If you fancy popping by my own blog my first post for the challenge is on ATTRACTION and you may enjoy reading it. You’re welcome it’s great to meet fellow like-minds online. True love exists. Perfect Relationships do not. Which means, while true unconditional love is possible, perfection is not. Intriguing points Shanaya and true! Of course, if he lets you eat tandoori chicken just grab the guy I say 😀 See you around! Well said. Acceptance is what we expect, but rarely think to dish out. Bingo. Great tips. Great post! My favorite saying is: Never suppress a generous thought! This is interesting. You made some valid points. I’m doing the A to Z Challenge as well. Love your theme and first post. One has to provide more benefit and create less cost for a relationship to continue and flourish. Nonacceptance and unrealistic expectations has a tinge of negativity. Is it? I agree on Perfect Relationships don’t exist. I liked this post on unconditional acceptance, it is not difficult to love unconditionally when we accept ourselves first as we are, without any conditions. The moment we put conditions for ourselves, than we struggle with others and we find it very hard as our expectations of wanting to be perfect puts a lot of pressure on ourselves. Some times the pressure to be perfect creates psychological issues for the persons, they develop anxiety and are never at peace… when I meet students who come with anxiety issues, one of the reason I find they struggle with is wanting to be perfect….. then I try and help them to see that it is ok not to be perfect, and one must learn to understand and accept oneself unconditionally .. when this happens, there is such a relief… thanks for the thought provoking post,appreciate you for sharing ! Absolutely true…to not to overthink is the best we can do!